Todd Rundgren has long defied any easy sort of characterization. A renowned songwriter, producer, guitar God, technophile and one of the most soulful and interesting singers of his generation, it is fair to say that Rundgren has mined more musical ground than anyone else Noisecreep can think of. From heart-wrenching ballads to metallic epics to soaring prog-rock (and everything in between), for decades he has staunchly produced the music that he wants, when he wants it. On April 9, Rundgren's 24th studio album, a provocative, groove-heavy collection entitled State, will be released in the US. Noisecreep had the distinct pleasure of speaking with the wizard, the true star - the one and only Todd Rundgren. He talks about what inspired him this time out, the upcoming tour, and how he manages to survive in an industry that doesn't usually take kindly to someone that refuses to play by its rules. Todd, certain solo albums of yours have distinct overall themes. Did you create State with a them in mind? Unlike a lot of my records, which have some sort of central theme, this record isn't really like that. What it is, is a series of somewhat contemporary cautionary tales. In other words, the songs come off as being about something specific or they set a certain mood but in reality, they are really about something different – that is to say the actual realities are perhaps different than what they seem to be about. For instance a song like 'Something From Nothing' - a lot of people's first impression is that I'm saying that faith is a good thing to have. And I'm not saying that. What I'm saying is that faith is possibly a necessary thing to have but that faith is a very limited thing and is not an adequate substitute for actually knowing something or doing something. So just sitting around thinking that faith can make things turn out okay is really just a waste of time [laughs]. So in that sense a lot of people are going to have a mistaken impression, thinking I'm coming from one direction when I'm really coming at it from a different angle. It's not like you have not been misunderstood before. [Laughs] Yes. And a lot of it is purposeful. I figure if I keep it vague it lets a greater number of people find an opportunity to let it fit impressions that they have – let them adapt it in their own way. You can get a sense of that from the title of the record. State can be a word that is a noun or a verb or an adverb - it's kind of why I chose that title. It's not to confound the audience but to keep me from painting myself into a cul-de-sac in the early stages of making a record by having too high concept or having some really strict set of rules I have to adhere to. That kind of record I intended to make was to be more open to new influences and so it was a matter of me feeling my around the contemporary music scene. That was sort of the general premise. What did you discover about contemporary music and how did you interpret it? I do a lot of research before I start a record depending on what kind of record I'm making. It may be more of an archival exercise, perhaps trying to recapture the aura of something earlier, an older style of making records – then again, with a record like this, like I said I'm trying to catch the contemporary flame. So I spent a lot of time on YouTube and it turned out to be a great asset for this kind of exploration because of things like that sidebar next to whatever you're watching which, after just a few clicks can take you through some really different realms. I would start out somewhere and then wander through all sorts of music videos, following certain listener trends by clicking on things associated with whatever I was watching. Every once in a while I would find something that was really interesting and then automatically I would stop listening to that because if I continued to listen to it I would literalize it – do the sort of thing you expect from someone who would do an exact literal translation of 'Good Vibrations [laughs].' If I listen to anything too much I'd start aping it and imitate it and I didn't want to do that. How did that get done? How did they accomplish that? And I didn't want to do that. I just wanted to grab the essence of certain directions and incorporate whatever the imperfections of my memory allowed me to. Believe it or not, there's hints of Bon Iver on the record and I only listened to Bon Iver once and then I had to stop listening or I might have started to imitate what I heard. Your voice seems exceptionally strong these day, in concert and especially on State. I've had some great opportunities as of late to focus primarily on my voice as opposed to other aspects of my performance. In particular, for my appearances with the Metropole Orchestra in Amsterdam, I focused completely on singing. At the same time I'm not just in front of a quartet but I'm front of a whole freaking orchestra so the level of my performance had better be commensurately improved for that [laughs]. There's that aspect – the fact that I've been pretty liberal in terms of what the setting is when I perform. So I sang before orchestras, and then I've got what I call my 'Performing Arts Center' show that features a lot of my most accessible material. Then I have the 'Unpredictable' show, which is me and a band doing a more or less improvised show, where we even learn songs during sound check. So I think that gamut of experiences has helped strengthen my voice. The video clips with the Metropole, in particular, are very impressive. Thank you. The amazing thing about the clips you see on YouTube is that was all done by one incredible one fan from over there who solicited camera phone footage from everybody who was there. And then he got a hold of the final soundtrack, which had all the sweetening and repairs and everything, and he created what is essentially a 25 or 30 camera shoot. There are two shows put together which are pure fan sweat equity. Creating these incredible documents of events, doing stuff like this could be a thing of the future as long as someone has the talent and energy to do it. If you tried to do it yourself it would be financially and physically impractical. You've got some major touring plans with State. What can you share about the show? I'm in the midst of building a system now. One of the things that inspired this record was that I would plan to perform it in a modern context without having to take a large band out. It's just Prairie Prince on drums, Jesse Gress on guitar and me running all the machinery, and there will be lights and effects. Essentially I want to bring the improvisational element back to what I do. In the early '90s I did the 'No World Order' show where I, as the DJ, would start the show and wouldn't have any idea how long the show would be but I had all the options in front of me. I would perform accordingly and try to react what was happening in the audience. I've been working with some younger artists and went to see one at a DJ event recently and something clicked. I thought, hey, I've done this before - but when I did it years ago I had to build everything from scratch [laughs]. I had to write all the software and build the hardware and it was a nightmare but today a guy with an iPad and a laptop can use improvisation and have the musical flexibility to do a different show every night so there is a certain troubadour aspect to that. I want to recapture the ability to use a minimal amount of resources and be able to create the maximal amount of music. The shows will be different every night, it will be danceable and there will be lots of pretty lights [laughs]. Sounds like you'd fit right in at the Coachella festival. Perhaps. Sometimes your name just doesn't come up and then again sometimes it always comes up but it doesn't make a difference, like with the Rock 'n Roll Hall of Fame [laughs]. Your fans, as they do, are rabidly awaiting this new record. It must make you feel good to have this loyal bunch supporting you. My rejoinder is, if I did that, it's likely that I would have no real career because of the fact that if you let the audience or the marketplace dictate certain songs or a certain style then your fate is completely in their hands. And so if they decide something is more interesting to them, then they leave you and you have to go away for 20 before coming back as a retro act. Does it frustrate you to get defined in terms of strictly commercial terms? Absolutely. And in strictly technical terms, I'm not a one-hit wonder as some suggest. I've had a couple of hits, but still all of my hits were in the '70s. There was pretty much nothing in the '80s, '90s or in the first full decade into the next millennium. I've yet to have anything go to the top 20. But I had the advantage of being a record producer. That liberated me musically. For most artists, their careers are dependent on the success of the next project so they only have to make considerations and accommodations that they think the audience will react to. And I had the great luxury of only having to apply that thinking to the artist I was producing. I could figure out their audience and not worry so much about my own audience [laughs]. I was making so much money from production that I never had to worry about surviving in music. I never had to worry about having a hit. And to my mystification there was still actually an audience for me; an audience that doesn't want to be analyzed beforehand [laughs]. This June, you'll be holding ToddStock II near New Orleans, to celebrate your 65th birthday with lots of diehard fans. The Toddstock thing is the closest thing I have to say, a Grateful Dead sort of thing where it all lapses over from the formality of a concert into more of a lifestyle thing. Maybe even comparable to Jimmy Buffett [laughs]. Like he's got his parrot heads and even though it's a Jimmy Buffett concert, the music is almost secondary to the general level of debauchery. When I turned 60, a couple of other events were happening. I just finished building my house on Kauai and I had a new album coming out called Arena so that was rolled all together and we invited everybody who could make it for a week and we had this great free-form gathering. Everyone had a great time and I was going to wait until I turned 70 before doing it again. I think a bunch of the fans started thinking either I or them would not make a 70! So we decided to hold it now, at a beautiful plantation in Louisiana called the Nottoway. We expect that it will be a total weeklong party, that the guests will bring their own expressions and trick out their own camping areas, creating little salons. I'm not doing the entertaining, per say, but everyone will be entertaining everyone else. 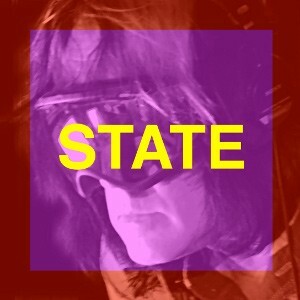 State will hit stores on April 9.